Swiss Police Single Magazine or Knife Case Black Leather 1990s Production 226Z W. Bauer Zürich Buy 3 Ships Free! Description: This listing is for One magazine or knife case. Buy any combination of 3 non gun non ammo items, and shipping is Free for the entire order lower 48. Photos are representative, but buyer will receive a virtually identical case from the same issue lot. From two decades of service with the St. Gallens Kantonspolizei in Switzerland come these attractive and useful Mace, Knife, or Magazine Cases. Manufacturer was W. Bauer of Zürich. These served as Magazine Cases for the Canton’s Police in tandem with Sig Sauer P226 Pistols. Construction is genuine Swiss cow leather, with nickel plated brass snaps and cotton stitching. Type is mid ride single magazine case, where the floor plate sits slightly above the duty belt’s top edge. Production date was 1996 – 2006 vicinity from the date codes on the parent pistols. 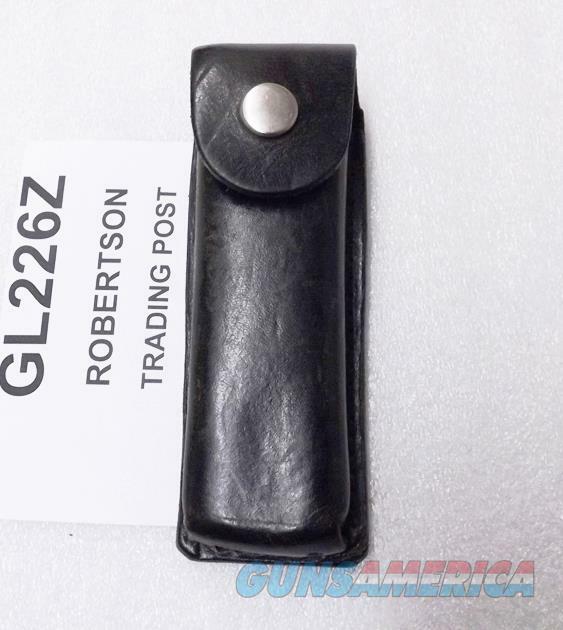 Internal dimensions of the interior are 1 1/2 by 3/4 inches, with a depth of 4 3/4 inches closed, precisely the size for standard double stack magazines like the P226. The Smith & Wesson MP45 and Sig P226 Magazines showing are not included. This case, then, will easily accommodate most double stacked 9mm or .40 caliber magazines, but .45 and 10mm double stacks are literally a bit of a stretch. Folding knives up to 5 inches overall length are a go on these cases. Reverse side belt slots are 2 inches long, so 1 3/4 inch width or smaller belts. This pouch will be a NO GO on a Sam Browne style US Issue duty belt. It will Not work on a US Military ALICE Belt; will NOT work on a black nylon 2 inch belt. Finish is semi gloss black dye on brown leather. Surface detractions are moderate, normal duty surface wear. Snap strength is excellent, and there are no tears in the stitching or leather itself. We rate these magazine cases as Very Good, 80 percent vicinity by our estimate, but photos ought to suffice for our distinguished shoppers to judge finish grade for themselves. Replacement pricing for similar leather cases often ranges upwards of $50 per unit. We're offering the Bauer Swiss Knife or Magazine Cases in the photos, however, each for only	$ 9.00.